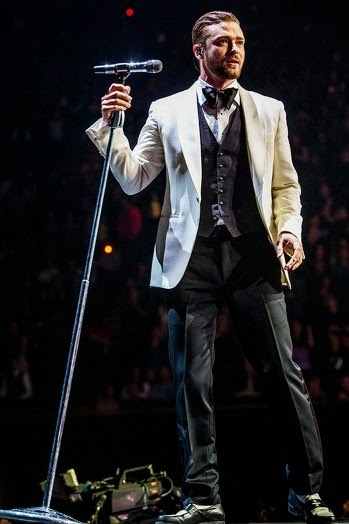 Justin Timberlake received seven Billboard Music Awards, which measures honors by sales, radio airplay, touring, streaming and other metrics, Sunday taking home trophies for Top Artist, Top Billboard 200 Artist and Top Billboard 200 Album ("The 20/20 Experience") in a three-hour show at at the MGM Grand Arena. Rapper Pitbull kicked off the show alongside Lopez and Brazilian singer Claudia Leitte with a performance of "We Are One (Ole Ola)," the theme to next month's soccer World Cup in Brazil. Imagine Dragons won five awards, including top Hot 100 artist for songs' chart performance, top rock artist and top duo/group among others. The Grammy-winning Las Vegas band also performed their song "Tiptoe" on the show. R&B singers Robin Thicke, Pharrell Williams and rapper T.I. scored four wins on the back of their megahit "Blurred Lines," including awards for top Hot 100 song, digital song and radio song and R&B song. Seventeen-year-old pop sensation Lorde, dressed all in black with black feather fringes, captured the award for top new artist and top rock song for the hit "Royals," which already landed her two Grammy Awards this year. Jennifer Lopez was honored with Icon Award for lifetime achievement, and country singer Carrie Underwood won the fan-voted Milestone Award. The show featured numerous performances, including the late King of Pop Michael Jackson as a hologram, performing his posthumously released song "Slave to the Rhythm," Shakira, Jennifer Lopez, country duo Florida Georgia Line with country singer Luke Bryan, Nickelodeon star Ariana Grande and Australian rapper Iggy Azalea.